We’re just a couple of days away from the kick-off of PlayStation Experience and we can’t wait to spend the weekend with everyone in Anaheim and with all those following along from home. We’ve got a lot of fun things planned as part of our Uncharted 10th Anniversary celebrations, a great panel lined up for The Last of Us Part II, and some cool new merch. Don’t miss our Uncharted 10th Anniversary panel at 5:00pm PT (Find Your Local Time) live on the PlayStation Experience stage and broadcasting on live.PlayStation.com. We’ve gathered members of the cast of Uncharted, both past and present, for a look back on the last ten years of adventure. Tune in or attend live as Nolan North, Emily Rose, Richard McGonagle, Claudia Black, Laura Bailey, Troy Baker, Graham McTavish, and Robin-Atkin Downes chat with moderator Greg Miller of Kinda Funny. We’ll also be hosting a signing session with the cast at 3:00pm. If you’re at PSX, come on by to meet the cast, receive a special Uncharted 10th Anniversary mini-poster, and have it signed. See the Experience PlayStation app for location information. 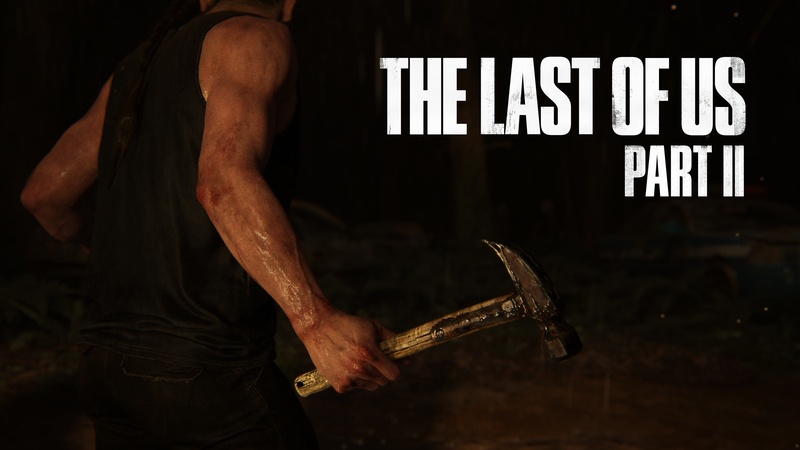 Not long after the Uncharted 10th Anniversary panel, we’ll be hosting a The Last of Us Part II panel at 6:30pm PT (Find Your Local Time). Our own Neil Druckmann (Director and Co-Writer) and Halley Gross (Co-Writer) will be joined by moderator Hannah Hart and members of the cast as they discuss the making of our latest trailer, revealed just a few short weeks ago at Paris Games Week. Afterward at 8:00pm PT, join Neil, Halley, and the cast for a signing session where we’ll be giving out a The Last of Us Part II mini-poster. See the Experience PlayStation app for location information. If you’re going to be on the ground in Anaheim, be sure to drop by the Uncharted 10th Anniversary booth, where we’ll have game stations, a photo opp, and a real-life recreation of Nathan Drake’s attic from Uncharted 4. On Saturday and Sunday, team up with friends and other fans at PSX to explore the attic and to discover clues to solve a puzzle crafted by Nate. You can also check out a display of rare relics and props from the Uncharted series, gather around for a group photo at the photo booth, or get hands-on time with Uncharted: The Nathan Drake Collection, Uncharted 4: A Thief’s End, or Uncharted: The Lost Legacy at one of our game stations. Can’t make it to the show? Don’t worry; we’ll be sharing the experience on Naughty Dog’s social channels. Follow us on Twitter, Facebook, and Instagram to see photos, updates, and more from PSX. 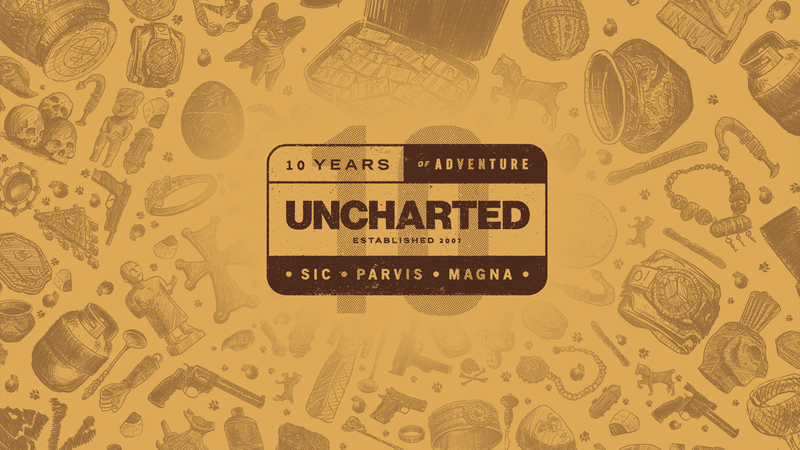 We’ve also worked with artist Paul Mann and iam8bit to produce a limited-edition Uncharted 10th Anniversary poster, which will be available for sale at the iam8bit booth. Speaking of iam8bit, you may have caught the news earlier this week about the Uncharted: The Lost Legacy soundtrack receiving a two-disc vinyl release. The vinyl will be up for pre-order starting Saturday at the iam8bit booth at PSX, as well as on iam8bit.com. Those that pre-order over PSX weekend will also receive a special Uncharted: The Lost Legacy slip mat. 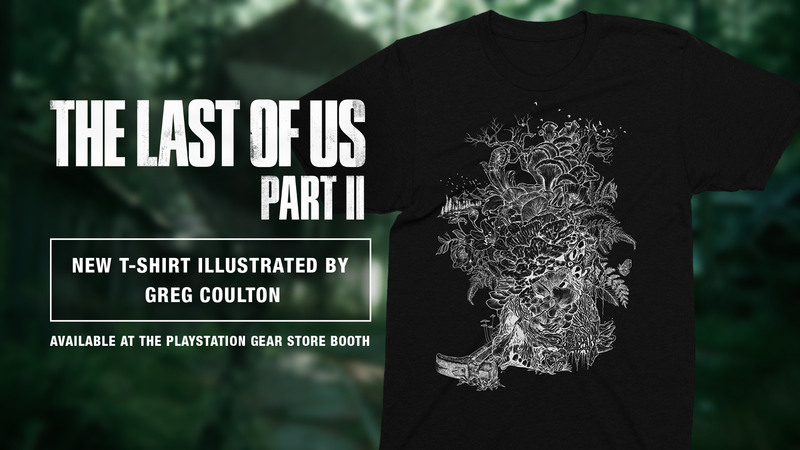 For our incredible The Last of Us community, we’re also excited to introduce a new The Last of Us Part II-inspired t-shirt featuring an original design from Greg Coulton. 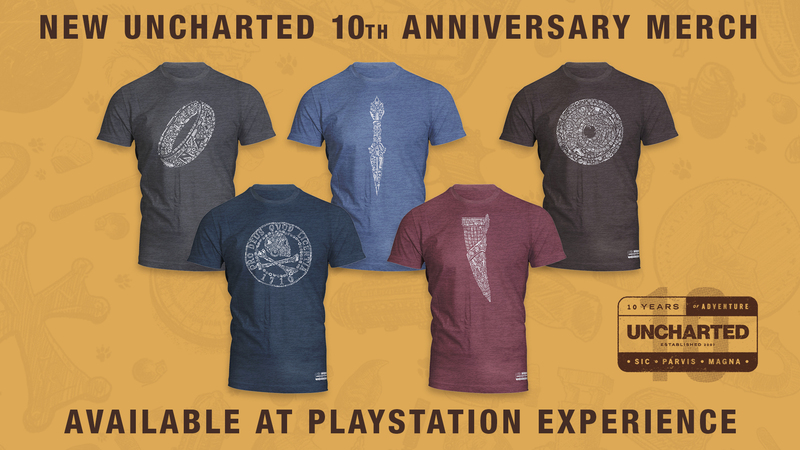 Be sure to check out these and other Uncharted and The Last of Us merch at the PlayStation Gear Store and iam8bit booths all weekend long while supplies last. 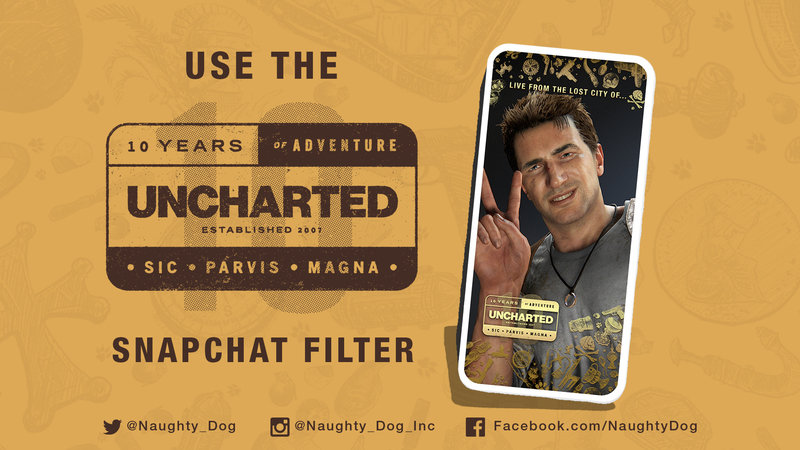 Last, but certainly not least, while you’re checking out our Uncharted 10th Anniversary celebrations at PSX, be sure to tag your posts with #Uncharted10 and if you’re an avid Snapchat fan, use our Uncharted 10th Anniversary geofilter, available at the Anaheim Convention Center throughout the weekend. We can’t wait to see you all this weekend and share the experience with everyone tuning in from around the world. For more on Naughty Dog @ PSX, be sure to follow us on Twitter, Facebook, and Instagram.